Work on the design, development and testing of next-generation prosthetic hand technology by a team of researchers from Arizona State University, Mayo Clinic and the Italian Institute of Technology will proceed with support from the National Institutes of Health (NIH). 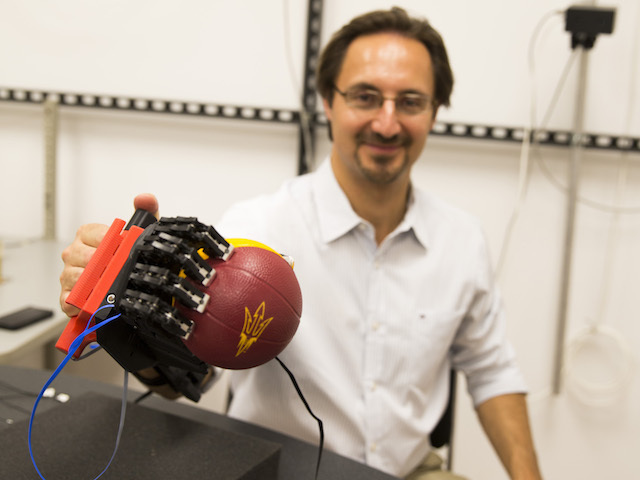 Neurophysiologist Marco Santello, physician Karen Andrews and roboticist Antonio Bicchi are collaborating on a project that employs new advances to simplify the control of grasping movements by a robotic hand. 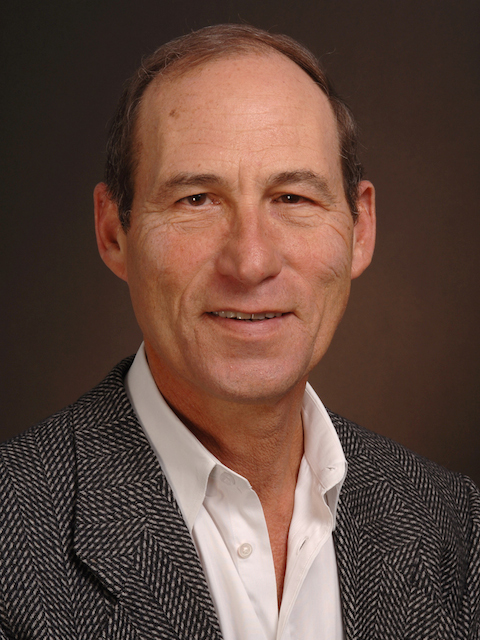 Santello is a professor and director of the School of Biological and Health Systems Engineering, one of ASU’s Ira A. Fulton Schools of Engineering. Andrews is the director of Amputee Rehabilitation Services in the Department of Physical Medicine and Rehabilitation and director of the Vascular Ulcer/ Wound Healing Clinic in the Gonda Vascular Center at the Mayo Clinic in Rochester, Minnesota. Bicchi is a professor of robotics at the University of Pisa, and a senior scientist at the Italian Institute of Technology (IIT) in Genoa. 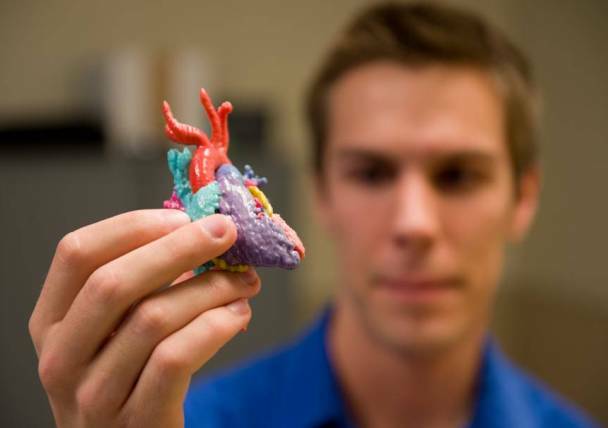 Their progress has earned an NIH R21 grant that will provide them approximately $400,000 over two years to pursue improvements in artificial hand technology. Despite advances in prosthetic hands, current technologies still provide only limited functionality and lack adequate grasping capabilities, Santello said. Costs, the weight of devices, durability and maintenance are additional drawbacks to existing hand prostheses, he said. To improve the technology in each of these areas, a new prosthetic hand will be fashioned using designs originated by Bicchi and his collaborators at IIT and the Italian Centre for Health and Safety at Work (INAIL). They have been developing a prosthetic hand based on the innovative robotic hand called the Pisa/IIT SoftHand, developed by the researchers at the University of Pisa and IIT. The design of the SoftHand is based on “soft synergies” that capitalize on human hand synergies and novel “soft” robotics technologies. The Softhand was initially designed and used for robotics applications, but preliminary data indicate it can be adapted to enable people to grasp and manipulate a wide variety of objects with minimal training. The key is a design based on natural finger coordination patterns, making it easier to control. Typically, prosthetic hands require motors to control the movement of each joint. In contrast, the SoftHand uses a technique described as underactuation, meaning that one motor can control movement in more than one joint. That capability provides for more simplified and user-friendly hand motion and reduces the weight of the device. The patterns of finger motions that can be generated by the SoftHand are based on experimental observations by Santello and his colleagues of how multiple joints in the hand move together. 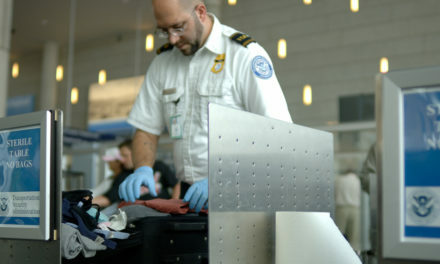 The SoftHand also features compliance control, making it effective for both delicate and forceful manipulation tasks. The ASU, Mayo and IIT research project will focus on the adaptation of the SoftHand to people with amputations, with the aim of providing clinical feedback that will guide design modifications of the SoftHand to develop new myoelectric prosthetic hands. Myoelectric pertains to the electrical impulses generated by muscles. The impulses can be amplified and used to control artificial limbs by activating the motors of prosthetic devices. “We expect that by using a very small number of extrinsic hand muscles in the forearm, people with a transradial amputation (an amputation below the elbow) will learn to use the new myoelectric hand and perform grasp and manipulation tasks to a greater level of proficiency relative to what they can do with the prosthetic hand they are now using,” Santello says. Myoelectric hands are controlled by the users’ signals associated with tensing and relaxing of their extrinsic muscles individually or together. Electrodes in contact with the skin on the forearm will pick up electrical signals and transmit them to a controller. The unique feature of the SoftHand is that the controller processes and analyzes the electrical signals and maps them to one actuator (a motor) that moves multiple joints in a coordinated fashion. The research team will analyze the mapping of electrical signals to specific hand postures and forces, as well as the extent to which grasping and manipulation performance can benefit from adding force-feedback mechanisms to the SoftHand. The project will quantify the functional capabilities of the SoftHand for prosthetic applications. Biomechanical tests and movement tasks used by clinicians will allow researchers to assess the functionality of the new device on individuals with limb loss. Santello and his collaborators believe that users of the SoftHand will learn to use it to perform grasp and manipulation tasks more easily than with current devices. They expect the outcome of the project to provide the basis for further refinement of design and development of a high-performance prosthetic hand that has superior functional capabilities and could be produced at a comparatively low cost. Mayank Prasad contributed to this article. What stops content from going viral on social media?